Years ago Hutterites' winter wear did not include coats with hoods. Perhaps they were seen as "too worldly", I'm not sure. Since Hutterites settled in areas of North America which are subject to severely cold winters, they naturally had to find ways to keep their heads warm. Men wore fur caps, in Hutterisch known as Kopm. I still remember my dad wearing one of those - there was no way any kind of cold could penetrate this type of head gear. When I see photos of a Kopm, I think of Russia and wonder if that's where the Hutterites started wearing them. Women, especially the grandmas kept their heads warm with a Hinterbind-Tiechl. Not quite as warm as the men's fur cap, I assume, but it did the trick for many years. Most likely women would not have spent a whole lot of time outside anyway; at least not as much as the men, who always walked to the barns and shops, which were often a considerable distance from their houses. These Hinterbind-Tiechlen tended to be quite fancy, with colourful embroidered borders with flowers and the name of the person who it belonged to in big, bold letters. The Hinterbind-Tiechl shown above belonged to my grandmother, and as you can see is over 70 years old. This was an era when both men's and women's clothes were quite dark. Which makes me wonder about those fancy bright-coloured borders on the Hinterbind-Tiechl. 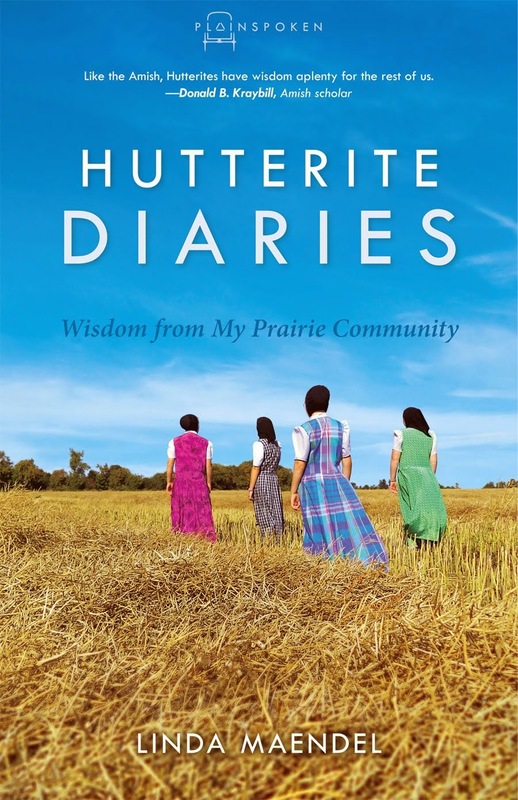 I believe the Hinterbind-Tiechl says something about the Hutterite women back then: they were practical, knew that it's important to keep their head warm, and in their own unique way added flare and beauty to their clothes, despite the fact that bright, bold colours were frowned upon. Today, when I see head coverings with fancy little borders, I'm reminded of the woolen headcovering of yesteryear: Hmmm, I muse, not quite as big and bold as yesteryear's, but floral-bordered head coverings are definitely making a comeback. Recently, my sister-in-law wished for one of those woolen wonders to wear in winter. My mom found a plain black one and gave it to her. 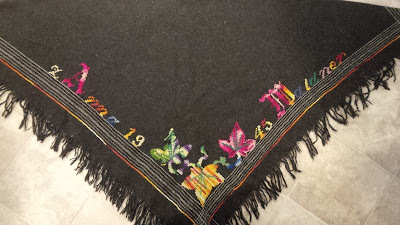 I'm not sure if she can embroider, but I can certainly see how she would find joy in adding a bright yellow border to her new-old Hinterbind-Tiechl. That is quite lovely. Thanks for sharing this. You're welcome, Michelle . I'm glad you enjoyed it. Such beautiful embroidery-- so lighthearted and yet so exquisitely worked. Is this something that would be worn all the time in winter, or an outer garment that's just for wearing outside? Rafqa,no this was not worn all the time in winter, but just for outside. You're right, the embroidery on these head coverings were always very beautiful. Oh the bright yellow border is almost planned out. I need something to experiment the embroidery on. I LOVE my Hinterbint-Tiechl and have worn it a few times this winter. It's warmer than a toque or scarf. I assume it's going to be sunflowers, Karen. I actually like the idea of flowers on winter wear. It's sort of gives winter a hopeful look: "Spring always comes, no matter how long and cold winter is." Well, now, I'm voting that we get to see it when it's done. OK, Rafqa, will work on my sister-in-law, to ensure, once her Hinterbind-Tiechl has its border, she needs to send me a picture to post. I own both my grandmother Stahl and great-grandmother Stahl's embroidered winter Tiechle. When my grandmother passed away, I was gifted her Tiechel by my aunts as a namesake. They were not aware that my grandmother had already bequeathed my great-grandmother's to me one year as she was fall cleaning. Both treasures and yes, they were worn regularly as you can tell by a beautifully darned worn spot. Thanks for sharing, Kathy. What a nice story and for sure, lovely keepsakes for you.